Like us, our dogs need to have good breath too. However, it’s not just a matter of preventing that stinky breath, it’s also about taking good care of their oral health. That said, it’s only important that you buy the best dog toothpaste and toothbrush for your furry friend. In this article, we’re going to review some of the best dog toothbrushes on the market. But before that, let us first figure out the factors that you have to consider before you buy one. Regular – a regular toothbrush made for dogs actually resembles that of our own toothbrush. However, a regular dog toothbrush comes with even softer bristles to prevent injuring your pet’s fragile gums. Also, its head is angled a bit more acutely so you can efficiently clean your dog’s teeth. You should keep in mind that a regular toothbrush we humans use shouldn’t be used for your dog considering that a dog toothbrush is designed in a way that it can accommodate the many shapes of the canine teeth. Dual head – this refers to a toothbrush which comes with 2 brush heads located on both ends of the handle. One head is wider, making it the ideal choice for cleaning a larger dentition. Meanwhile, the other head is smaller and has fewer bristles which are perfect for dogs with smaller teeth. Finger – a finger toothbrush is designed in a way that you can wear it over your finger to allow easy brushing of your dog’s teeth. This type of dog toothbrush is mainly designed for larger dogs as it can be fitted easily inside of their mouth. 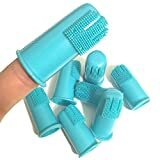 Also, a finger toothbrush is perfect for removing food particles and other dirt which might be stuck in your dog’s teeth. Another factor you should consider when shopping for a dog toothbrush is its formulation. As mentioned earlier, a dog’s toothbrush is not the same as a regular toothbrush we use. Therefore, you should make sure that the one you plan to buy is designed exclusively for dogs. The size of the toothbrush you want to buy should be proportionate to your dog’s size. If you have a large dog, you want to buy him a large toothbrush which can accommodate his brushing needs. Meanwhile, if you have a small dog, going for a small toothbrush is just ideal. Aside from the size, you should also consider the right length of the dog toothbrush you want to buy. This way, you can easily reach hard to reach areas for a more effective cleaning. Moreover, if you don’t want to get your hand into your dog’s mouth, then going for a dog toothbrush with a long handle is a good idea as well. Another important factor to consider when you buy a dog toothbrush is its bristles. As mentioned earlier, a dog toothbrush’s bristles are a lot softer to prevent damaging their gums. The question is, how soft? Ideally, they must be softer than even those of a baby’s toothbrush. After all, using a toothbrush that has hard or sharp bristles can only result in a lot of bleeding when you brush your dog’s teeth. This finger toothbrush from Pet Republique provides you with better and more precise control of the toothbrush head when brushing your pet’s teeth. This allows you to remove those stubborn food particles and plaque which got stuck inside of your pet’s mouth. 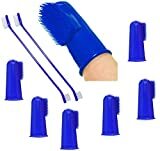 Since it is a finger variant, you can fit it easily over your finger to provide you with absolute control when brushing. Aside from that, the toothbrush is made of safe materials, so you don’t have to worry about the harmful effects it might give your pet. This brushing kit from Boshel includes a finger dog toothbrush and two long-handled dual head toothbrushes, making it ideal and more convenient if you have more than one dog. Also, it’s a perfect option if you have both big and small dogs. This C.E.T toothbrush from Virbac comes with two heads at both ends for both large and small tooth surfaces. Aside from that, it also comes with soft bristles to reduce, if not prevent, injuries when brushing your dog’s teeth. The CET Pet toothbrush is specifically designed for smaller dogs and cats. The toothbrush comes with a single head and soft bristles that are gentle to your dog. However, its 6-inch handle might be too short for those with bulkier hands. Although the CET toothbrush has a very simple design, you can really rely on its effectiveness when it comes to cleaning your dog’s teeth. Though a bit smaller compared to other dog toothbrushes on the market, the Duke’s dog toothbrush surely is a very efficient one when it comes to cleaning your dog’s teeth. Its 8.5-inch handle allows you to reach the deeper areas of your dog’s mouth with ease. Aside from that, it has extra-soft bristles to prevent injuring your dog’s gums. Although the brush’s small size makes it ideal for use on small dogs and puppies, it can also work perfectly on larger dogs. Having a resemblance to that of the finger toothbrush from Pet Republique, the only difference with H&H’s product is that it is actually a bit more affordable. It is made with the use of materials that are approved by the FDA, not to mention its bristles are moderately soft to make sure it can efficiently remove any food particles and plaque in your dog’s teeth. 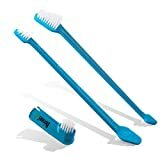 If you want something different or unique for your dog, then this toothbrush by Mind Up is for you. Compared to your typical dog toothbrush, this one comes with a circular head. Aside from that, it only features 4 clusters of ultra-thin bristles. Lastly, its handle is angled at two points, making it easier to clean those hard-to-reach areas of your dog’s mouth. The EZDOG Triple Pet toothbrush has a unique design which ensures that every inch and corner of your dog’s teeth, gums, and tongue are properly cleaned. Its design looks as if you’re running your dog’s teeth through the cleaning drums which you can find in a car wash.
Aside from that, it also features a built-in tongue cleaner which is located at the base of its handle. When you look at it, the overall design of the EZDOG toothbrush looks way fatter than the rest of the dog toothbrushes we have in this list. Although this can allow you to hold it comfortably, it does have the problem of being too short to reach the entire area of your dog’s teeth. This toothbrush pack from RosyLife features two sets of dual-end and finger toothbrushes. If you have a lot of pets in your household, then this could be a really excellent option. The four dual-head toothbrushes in the package come with slim 8.5-inch long handles which are all textured on one side to help you grip it comfortably when brushing your dog’s teeth. Meanwhile, the finger brushes are all made of silicone and come in four colors. Mascota Pet’s toothbrush package is almost similar to that of RosyLife except that it only includes 2 dual-head toothbrushes but 6 finger toothbrushes which are also made using food-grade silicone. Similar to RosyLife’s dual-head toothbrushes, Mascota’s also come with super-slim handles which might not be ideal for those with bulkier hands. That aside, the fact that all of the toothbrushes have very soft bristles make this package really worthwhile for your pets. Q: How often should I brush my dog’s teeth? A: Just like us, your dog can also benefit greatly from regular brushing which should be done as often as possible, ideally on a daily basis. By brushing your dog’s teeth daily, you will be able to get rid of all those bacteria in his mouth which are stuck on food particles from the food he’s eaten during the day. A: As mentioned a few times earlier in this article, you should NEVER use a toothbrush made for humans on dogs. Toothbrushes which are designed for humans have hard and stiff bristles which can injure and damage your dog’s gums. You have to keep in mind that toothbrushes designed for dogs have very soft bristles that will prevent such injury from happening. Also, toothbrushes designed for dogs are made with the canine teeth in mind. Q: How often should I replace a dog toothbrush? A: It will depend on the quality of the toothbrush. If it’s a poor quality product, you can’t expect it to last for a long time. Normally, it would only last a month or even just a few weeks. Also, the frequency of brushing can affect the lifespan of your dog’s toothbrush. If you brush your dog’s teeth on a daily basis, you can expect the toothbrush to last only for around 2 months. Meanwhile, if you brush his teeth on a weekly basis, it could last for around 4 to 6 months. However, it is recommended that you brush your dog’s teeth daily, so it would also mean that you’ll have to replace his toothbrush once every 2 months. Q: How to clean my dog’s toothbrush? A: Cleaning your dog’s toothbrush is actually simple. Simply rinse it under warm water after each use. While doing so, make sure you remove any particles that are stuck on the toothbrush using your fingers. For even smaller particles, simply use a toothpick. Q: How to make my dog sit calm while brushing his teeth? A: Ideally, you want to train your dog to make him get used to brushing his teeth while he’s still a puppy. However, if you weren’t able to do so, you can instead tire him out by having him undergo any vigorous physical activity for around 30 minutes or more. This way, he will have released most of his energy, leaving him with very little to even resist teeth brushing. However, if it’s the first time your dog has experienced brushing, you can make him get used to the feeling by rubbing your thumb and index finger into his gums. Once he’s accustomed to it, you may then start brushing. Always make sure that you make your brushing session pleasant for your dog so he won’t associate it with a bad experience. When it comes to brushing your dog’s teeth, you have to make sure that you only choose the best dog toothbrush on the market, similar on how you would choose dog nail clippers for his nails. 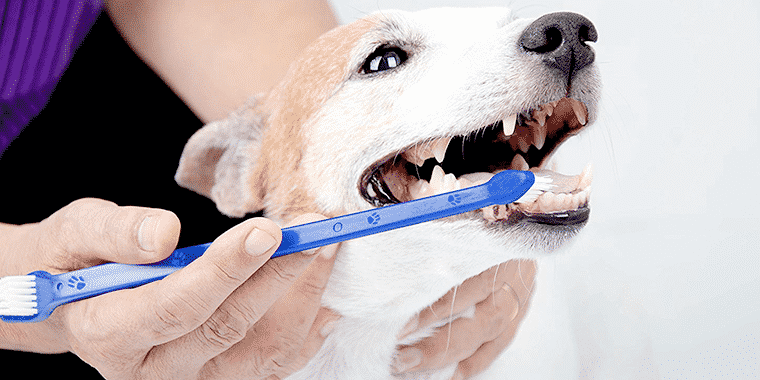 With the ones we have provided on the list, looking for the perfect brush that can help you maintain your dog’s oral health can be pretty quick and easy.